Australian Emily Barker has been firmly in the spotlight over the past decade with her band The Red Clay Halo (who played at the London Olympics opening ceremony) along with her stints in Vena Portae and Applewood Road. Her songs have been featured on the BBC’s Wallander and The Shadow Line while she also provided the soundtrack for Peter Mullan and Jake Gavin’s film, Hector. Her voice, always warm and direct, and her various recordings have seen her firmly set in the folky side of country pigeonhole but Sweet Kind Of Blue finds her heading into country soul territory, geographically as well as musically as she headed off to Memphis to record the album. Teaming up with Grammy award winning producer, Matt Ross-Spang (who has worked with Jason Isbell and Margo Price), Barker set up shop in Sam Phillips’ Recording Studios (built when he outgrew Sun Studios) and with the cream of local musicians set about the album. A fan of Aretha Franklin and Otis Redding as she grew up Barker slips into Memphis mode with ease on the opening title song which has the signature cropped guitar, organ swirls and female chorus which one associates with the heyday of Stax and Muscle Shoals. This Memphis groove is revisited on the swampy and sultry Sunrise which just nails that late sixties vibe that had everyone from Elvis to The Stones’ heading to Memphis to record as Barker’s voice is infused with southern soul. If We Forgot To Dance opens with Barker singing like a torch song chanteuse over a solo jazz like guitar before the band and horns kick in for a “blue-eyed soul” train ride that is silky smooth as it undulates and seduces over its five minutes of radio friendly rhapsody. Finally, there’s the hotwired soul abandon of More! with Barker capturing some of the ebullience of Aretha singing Think. Barker intersperses these soul inspired songs with several that don’t go the whole Memphis soul hog which reduces the album’s impact somewhat. Sister, Goodbye, a tribute to Sister Rosetta Tharpe, is a late night torch song with tasty guitar licks that does pick up some muscle as it progresses and No. 5 Hurricane is an impressive and impassioned love song as Barker sings of finding a new love as she recalls intimate moments from a previous relationship. There’s a quiet majesty and dignity in this song which one can imagine being sung by artists as disparate as Sandy Denny and Lucinda Williams as it captivates the listener. Speaking of Denny, Change is a chunky number which recalls Richard Thompson’s work with Linda Thompson, his melancholy echoing throughout the song while the closing Underneath The Honey Moon finds Barker baring her emotions as strings swirl and an electric guitar glistens with a blue velvet thrill. 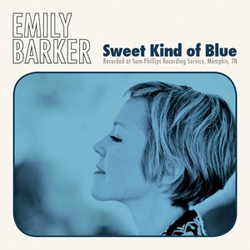 Quibbles regarding the overall song sequencing aside, Sweet Kind Of Blue is a powerful listen with Barker well able to summon up the ghosts of Memphis soul while demonstrating that she can rival many of our contemporary singer songwriters.